(4) Hipshot HB5 American Classic tuner set for most Rickenbacker® 4000/4001/4003 Series Basses made from the late 70s to 2011. 27:1 ratio with adjustable tension. Includes mounting screws and peghead bushings. Tuning posts are 3/8"(9.5mm) diameter and tuner bushings are 7/16"(11.5mm) outside diameter. Mounting hole spacing is 13/16" across the top, 11/16" across the bottom and 1-7/16 from top to bottom holes. Due to varying peghead hole spacing there can be a tuner backplate overlap issue on some models. At least 1-3/8(35mm) space measured from the center line of each left and right pair of tuning posts is required to install. Check the diagram in the second picture of the listing and compare the dimensions to your factory tuner mounting location. The item "20520G-SET Hipshot HB5 Gold American Classic Tuners Rickenbacker Bass Guitar" is in sale since Friday, April 29, 2016. This item is in the category "Musical Instruments & Gear\Guitars & Basses\Parts & Accessories\Tuners". 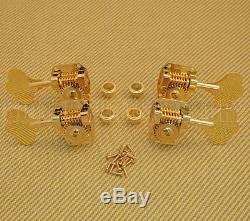 The seller is "guitarpartsfactory" and is located in Millersport, Ohio. This item can be shipped worldwide.